On a recent expedition off of Long Island Bahamas, a team of researchers, educators, and citizen science explorers, on-board the M/V Glen Ellen conducted a 5-Day study of 3 Nassau Grouper Spawning Aggregations (SPAG) in North Long Island; during these full moon phases in December, January and February – commonly known as a “Grouper Moon”! What was discovered is alarming and is a wake up call for all of us! Together with the Bahamas National Trust and BREEF, OCA hopes to raise awareness in the Bahamas, about the vital situation with the Nassau Grouper Aggregations; to the community and the necessary Government offices, who will write and pass the necessary legislature to save the Bahamas Nassau Grouper fishery. “An active and aware public will take action to support the oceans needs”, says Casuarina McKinney-Lambert Executive Director of Bahamas Reef Environment Education Foundation (BREEF). Complete story written by OCA, to be featured in the Guy Harvey Magazine Spring Issue. Speaking live for the hangout broadcast were the leading ocean science minds discussing how technological advancements are creating new ways to research, record and reveal the ocean’s health. - Dr. Sylvia Earle, Legendary Oceanographer. Dr. Earle was the “Queen” of the 45 minute broadcast, she is so eloquent and what Knowledge! It was all very informative and pretty cool. There were 248 people listening in on the Hangout from all over the world and OCA was privileged to be one of the lucky listeners. It is inspiring to hear the future plans of the Catlin Sea View Project. The conversation noted that image sorting technology that is key in making the project possible. They now have the ability to sort and assemble images, much quicker due to technology advances that were developed by the CIA to watch, profile and detect terrorists going through our airports. In a 12 month period the Sea View Survey team has been operating, they have collected 200,000 GPS location 360 degree images from 8 expeditions, on 32 reefs, covering 150 kilometers in the Caribbean (ABC, Mexico, Belieze, Bermuda), Galapagos and the GBR; and they presently are sorting and assembling 4000 images a day and to date have assembled 14,000. In the past to sort these 200,000 locations and images would have taken 10 years!! And all of this will be made available to the scientists and, morOCA, was invited by Google Ocean’s Director Jenifer Austin Foulkes and Catlin Seaview Survey Director Richard Veevers to a Google+ Hangout hosted by the Catlin Sea View Survey team for the official launch of Catlin Reef Recorde importantly the public!!! This is truly “game changing technology”!! OCA looks forward to continue to success with the Catlin Seaview team, around Long Island the proposed the Marine Management Area and the Southern Bahamas. 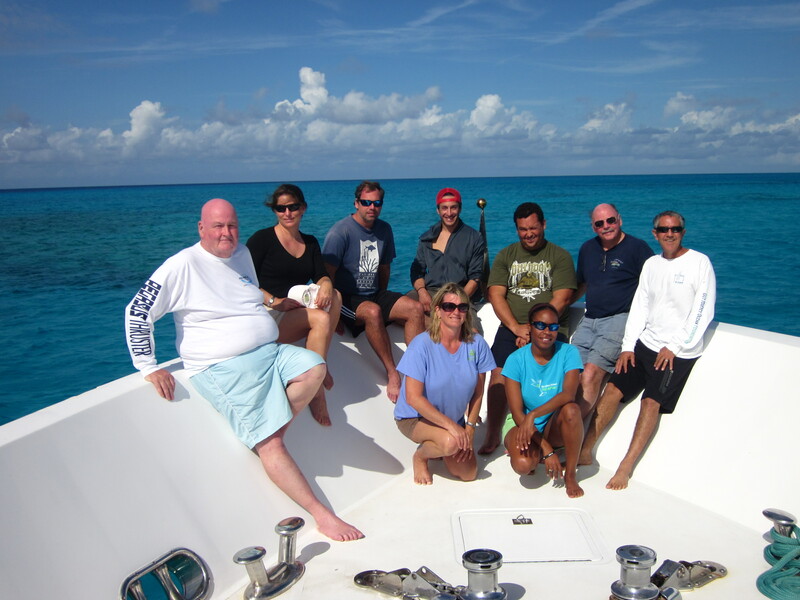 Catlin Seaview Survey Team was diving off of Long Island Bahamas. OCA welcomed the team of Christophe Bailhache and Stefan Andrews. We worked in and around the 350,300 acre proposed Long Island Marine Management Area (LIMMA). Utilizing a revolutionary new camera that takes continuous 360-degree panoramic images. The camera does for the underwater, what Google’s Street View did for dry land. Rapid fire 360=degree images are take every 3 seconds. Images are then stitched together and published online in a fashion that allows anyone with a desktop, laptop, tablet or smartphone to self navigate a “virtual dive” in stunning high resolution. For each image captured, a geo-location and camera direction is also recorded, meaning it’s possible to retake the photograph as a later date from the exact same camera position as the original. The positive implications for the scientific community and the long term monitoring of reefs are huge! Remember to check back for updates on this exciting project! 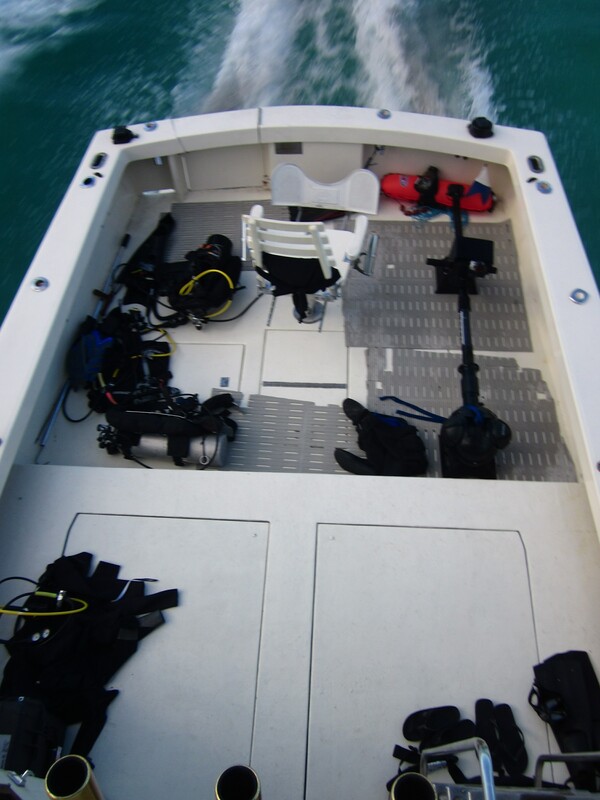 Pictured, looking down form the fly bridge, camera and dive gear on the back deck during the ride back to the dock. Another successful day! 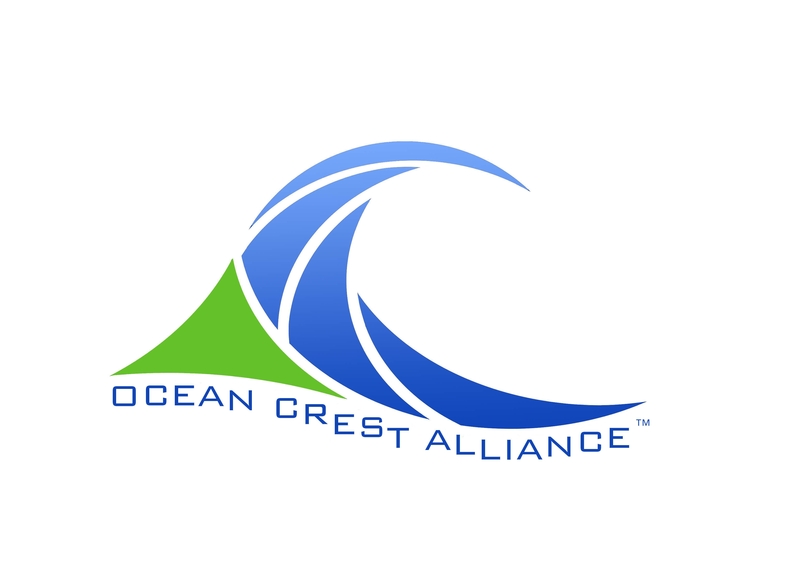 An Important announcement from OCEAN CREST ALLIANCE! On October 2013 Ocean Crest Alliance was approved by the IRS as an official USA 501(c)(3) non-profit public charity corporation! It is that time of the year again. Summer is here and it is time for fun on the water! And what better way to enjoy Florida than out on a Stand Up Paddle board (SUP)! The second annual SUPnKids Ocean Crest Experience is happening on August 9th – 11th,. 2013 at the Magnuson Hotel Marina Cove, St. Petersburg, Florida. Added to the weekend of events are several new participants and activities sure to make it a fun-filled learning experience for all of us! OCEAN CREST ALLIANCE was honored to Participate in the Caribbean Challenge Initiative Summit. Visionary and proactive Caribbean countries, global corporations and partners chart a new course for the future of the region’s marine and coastal environment and economy at the Caribbean Summit of Political and Business Leaders. Increasingly, political and business leaders in the Caribbean are coming to understand that the beauty and bounty of the region are the foundation of the region’s economy — and its future. The Caribbean Challenge Initiative (CCI) was launched in 2008 to help governments take a proactive, science-based approach to protecting critical marine and coastal habitats. The Nature Conservancy has played a key role in the CCI since its inception. We have helped participating governments lay the scientific and policy foundation to meet CCI commitments to set aside, effectively managing, and sustainably funding 20% of nearshore habitat in marine protected areas by 2020. Nine Caribbean countries and territories have endorsed the CCI. Most of these countries qualify for matching funds from the new Caribbean Biodiversity Fund, a $42 million regional trust fund. After five years, the time had come to shift ownership and leadership of the CCI from the Conservancy to the Caribbean countries themselves and engage the corporate sector that directly impacts and benefits from the beauty and bounty of the Caribbean. During the weekend of May 17-18, 2013, Phase II of the Caribbean Challenge Initiative (CCI) was officially launched at the Caribbean Summit of Political and Business Leaders, in the British Virgin Islands. The Summit was organized by the Conservancy, Virgin Unite and the Carbon War Room and co-hosted by Prime Minister Keith Mitchell of Grenada, Premier Orlando Smith of the British Virgin Islands, and Sir Richard Branson, CEO of the Virgin Group. The event brought together heads of state, corporate executives, and key partners to accelerate conservation action in the Caribbean, celebrate the successes of CCI and launch Defend Paradise, a campaign to fund and promote Caribbean conservation through consumer engagement and corporate marketing. The Summit shifted primary ownership and leadership of initiative from the Conservancy to government leaders and corporate partners. However, the Conservancy will continue to be involved in the CCI and provide countries with technical and policy assistance. To build support for Phase II and lay the groundwork for a successful event, during the year leading up to the event, the Conservancy developed and followed a Roadmap to the Summit. Roadmap activities included numerous one-on-one meetings with government officials and a series of meetings organized for government representatives and corporate leaders. The Conservancy coordinated three Senior Official Meetings (SOM) that were hosted by the governments of The Bahamas, Jamaica, and Puerto Rico. The purpose of the SOMs was to bring together government representatives to craft the Caribbean Challenge Initiative Leaders Declaration on Marine and Coastal Resources to be officially announced at the Summit. The Conservancy hosted three Corporate Roundtables in major US cities to educate and engage corporations with Caribbean business interests and to draft the Corporate Compact to Safeguard the Caribbean’s Marine and Coastal Environment to be officially announced at the Summit. During the event, political and business leaders made a series of bold commitments to preserve and protect the Caribbean’s marine and coastal environments and the species. Endorsed Phase II (2013 – 2018). Endorsed the CCI’s overarching goals to effectively conserve and manage at least 20% of their marine and coastal environment by 2020 and creating national-level sustainable finance mechanisms to support the expanded protected area network. Committed to completing seven specific, measureable conservation actions. Established structural mechanisms to support Phase II implementation. Committed to organizing and participating in a CCI Financing Roundtable by 2014. Committed to organizing and participating in a second CCI Summit no later than 2016. Adopting six principles to guide their business activities. Working with governments on six priority conservation topics. Committing to measurable, time-bound and reportable results. Protecting sharks and rays throughout the Caribbean region. Establishing a systematic, regional framework for conserving the Caribbean’s marine and coastal environment, including creating additional marine protected areas. Increasing the transition from fossil fuels to alternative energy sources over the next five years. Bahamas: Approved draft legislation to establish a National Trust Fund for Protected Areas and pledged to further expand its system of marine reserves. British Virgin Islands: Adopted a Protected Areas System Plan calling for the protection of 33% of the territory’s marine and coastal environment. Grenada: Reaffirmed commitment and activities to exceed CCI goal by protecting 25% of its marine and coastal environment. Jamaica: Committed to protect 25% of its marine environment by 2020 and developing management and business plans for eight MPAs by 2017. Puerto Rico: Committed to double the number of protected areas and to partner with neighboring countries to create biological corridors. Sandals Foundation: Pledged US $1.5 million to support marine conservation and coastal livelihoods in the Caribbean. Bamboo Sushi: Announced a US $500,000 commitment to the CCI from profits of new restaurants he will open in the Caribbean. Hublot: Committed to fund the establishment of several coral reef nurseries and to serve as the “official timekeeper” for the Caribbean Challenge Initiative. Hublot is also releasing a Hublot Limited Edition watch, in partnership with The Nature Conservancy, to generate funding for conservation. NRG Energy: Committed to expand solar energy in the Caribbean. Disney Worldwide Conservation Fund: Granted the Conservancy US $350,000 for a youth education program about nature. Virgin Unite: Pledged continued support for the CCI process and US $100,000 to support the uptake of renewable energy in the region. As a first step, Virgin Unite, the Clinton Foundation and the Carbon War Room will undertake a feasibility study for Haiti. Germany: Nearly US $50 million for marine conservation, including US $26 million for the Caribbean Biodiversity Fund. The Nature Conservancy: US $8 million for the Caribbean Biodiversity Fund. United Kingdom: US $3 million for the C-FISH initiative in the Caribbean to improve the management of marine protected areas, provide sustainable livelihoods for local communities, and improve their resilience to climate change. World Bank: Efforts are underway to mobilize large-scale funding to support the Caribbean’s marine and coastal environment through the Global Partnership on Oceans (GPO) Fund. The Nature Conservancy and GOOD Corp – together with Tiffany & Co., Royal Caribbean Cruise Lines Ltd, KOR Water and Guy Harvey Sportswear – launched the Defend Paradise campaign. This campaign is a consumer-based initiative designed to generate funding for Caribbean marine conservation, including the Caribbean Biodiversity Fund, and raise consumer awareness of the marine environment. Defend Paradise will generate support by selling co-branded products, providing exclusive discounts and raising awareness through experiential marketing that brings the natural beauty of the Caribbean to life. Hey there! This is Leslie Kolovich and joining me today is Joe Ierna, the founder of Ocean Crest Alliance. I met Joe last year at the SUP’n Kids event in St. Pete. Ocean Crest Alliance is about inspiring ocean awareness and education globally through community. They work along side many groups with ocean initiatives with a goal of protecting 20% of oceans by 2020. Right now our oceans are critically unprotected with just over 1% being protected or managed. Joe lives in the Bahamas and one of the initiatives Ocean Crest Alliance, Bahamas National Trust, and The Nature Conservancy are working on together is the Proposed Bahamas Marine Protected Area, specifically, Long Island Marine Management Area 480,000 acres +/-. They have approached this with reaching out to the locals, working to protect the cultural heritage value of the community. Education and communication is key for any change, especially for a sustainable planet. Joe talks about the importance of creating Marine Managed Areas, that are enforced because one can have all kinds of rules on paper, but without enforcement it does not work. His theory, education and enforcement equals marine conservation (E2=MC). Also, he stresses, the approach for change needs to been done in a positive way. The ocean is key to so many aspects of human life both inland and coastal. It connects us all. If the ocean isn’t healthy we all suffer. The planet needs change now, and with the social media and online information systems we have right now, more people can spread the word and significant changes will happen. Again, we talk about how making small changes in our daily lives, educating, listening, and doing will make a difference. 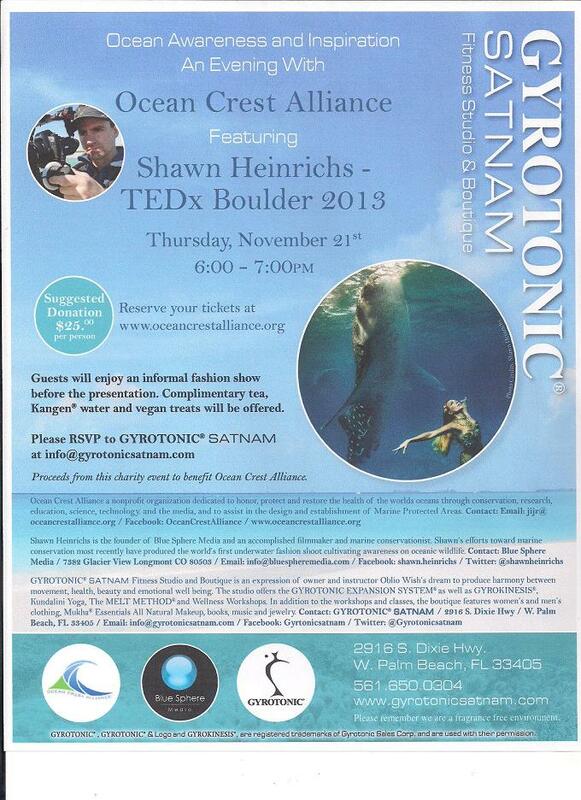 Be sure to check out SUP’nKids this summer, it’s a wonderful event for families in beautiful St. Pete Florida! Tina Braddock and the Super Star Bailey Rossen along with the Ocean Crest Alliance Team, run this event, and are for sure fantastic examples of people being ocean advocates! Last week a team of scientists brought together by The Nature Conservancy (TNC) returned from a two-week expedition to remote islands in the southeastern Bahamas (see map below). Offered the opportunity to use the Waitt research vessel, TNC pulled together a great team of scientists and organized an expedition in record time. They conducted an ecological assessment of several areas that have been proposed for protection, but were virtually unexplored scientifically. One step in creating MPAs is to understand what’s out there under the water so you can make a solid argument for why particular areas should be protected. The government here agrees – “science must drive informed decision making,” in the words of the Minister of the Environment, Mr. Dorsett. To facilitate this connection between science and policy, this past weekend the Waitt Foundation hosted a reception for the Bahamas’ political leaders aboard the Waitt vessel so they could meet the scientists, hear about the initial results, and discuss next steps. The Deputy Prime Minister, Minister of the Environment, and several other Ministers and Members of Parliament were in attendance, as were the heads of the Bahamas National Trust (BNT) and Department of Marine Resources (see photo below). The data from the expedition are still being analyzed, but one of the most interesting preliminary results is how few large fish (groupers and snappers) there were on some of the most remote reefs of Samana and Plana Cays. To me this is indicative of how little fishing pressure it can take to deplete a fish population. It also indicates the importance of protecting nursery habitats – these remote islands did not have much in the way of seagrass, mangrove, and tidal creek habitats where juvenile fish thrive, so the fish the scientists did see likely grew up elsewhere. Perhaps this is stating the obvious, but if an area’s fish population is not self-sustaining, you can’t expect to be able to fish there sustainably, which is a good argument for protecting that area from fishing. Scientists and politicians who met to celebrate the expedition and discuss MPAs in the Bahamas. Back row L-R: Lindy Knowles, BNT; Patricia Kramer, Scientist; Michael Braynen, Dir. Marine Resources; Philip Weech, Dir. BEST Commission; Eric Carey, Exec. Dir. BNT (partially blocked by my afro); Neil McKinney, President BNT; V. Alfred Gray, MP, Minister of Agriculture, Marine Resources and Local Government; Philip Kramer, Exec. Dir. TNC Caribbean and lead expedition scientist; Mr. John Canton, Dir. of Works; Vallierre Deleveaux, Scientist. Front row L-R: Captain Richard; Sandy Voegeli, Scientist; Alannah Vallacot, Scientist; Ayana, Waitt Foundation; Philip Davis, MP, Deputy Prime Minister of the Bahamas; Eleanor Phillips, Dir. TNC Bahamas; Kenred Dorsett, MP, Minister of the Environment and Housing; Renward Wells, MP, Parliamentary Secretary, Ministry of Works and Urban Development. Near the end of the gathering, the Environment Minister said, “The Bahamas has been and will continue to be a leader in marine protection and in the Caribbean Challenge.” I sincerely hope they not only lead, but raise the bar. The Challenge aims for 20% of marine area managed by 2020. I say “managed” isn’t enough; it should be 20% of marine area set aside as fish sanctuaries, marine reserves closed to fishing, by 2020. Then sustainably fish the other 80% of the Bahamas’ waters. As the nation with the largest exclusive economic zone in the Caribbean, there would certainly be plenty of places left to fish. But as the Deputy Prime Minister noted by way of allegory, if you dive into shallow water headfirst you can get paralyzed. He sees it as the role of science to ensure ocean management decisions are well reasoned and therefore more likely to succeed. Well, I’m certainly on board with science-based decision making. Here’s to such bold decisions, and them being made soon. The Spring 2013 Issue of the Guy Harvey Magazine is now Available. Featuring an editorial by OCA’s Joseph Ierna Jr. with a proposal for solving the Lionfish invasion in Bahamian waters! Illegal Poaching in Bahamas Waters! As with the threat of Illegal Fishing being experienced globally, even in the island Nation of the Bahamas, Foreign Illegal fishing outfits are waging an organized, assault on marine life in our oceans. For Lobster (or as the islanders call it (”crawfish”) this species poaching estimates alone represent 2 to 3 million pounds of crawfish tail per year illegally harvested from Bahamas Waters. At a wholesale level of $10 per pound, that alone represents 20 to 30 million dollars lost out of the Bahamian Economy. Illegal operations quite often operate large vessels, with 10 to 20 dinghy’s per vessel. They practice illegal fishing methods, using illegal fishing gear, fishing without licenses and act criminal like with there vessels hiding to avoid detection by authorities. It is happening year after year – and it is time to put a stop to this! At the end of this month, INTERPOL will host the 1st ever International Fisheries Enforcement Conference and Fisheries Crime Working Group at its headquarters in Lyon, France. This is a high level gathering, that will address questions like “What are the challenges of transnational organized fisheries crime and how can we fight it?” Fisheries managers from all over the world will collaborate and share strategies and information to build a future where these rampart illegal fishing operations must answer to the law. INTERPOL will outline a program of National Environmental Security Task Forces that have real teeth to identify, apprehend and prosecute criminal activity on our high seas. On Feb 16th, 2013 – 3:57 pm, Chrislyn Skippings RBPF, PACO of Mayaguana, Bahamas reports; He arrested – Eight (8) Dominicans in Bahamian waters off Mayaguana on Friday February 15th, 2013. According to reports, police along with residents of Mayaguana, including the island Administrator arrested the group around 10:00 am after they were found poaching. Police confiscated from the group, four (4) boats, fishing apparatus along with live and processed shelled fish. Active police investigations continue. Recognizing the growing threat posed by foreign illegal fishing, Senator Jay Rockefeller, Senator Lisa Murkowski and 8 co-sponsors introduced two important bills on February 11th in the US Congress—the Pirate Fishing Elimination Act and the International Fisheries Stewardship and Enforcement Act—that would safeguard U.S. ports, strengthen enforcement, and protect American fishing interests. This follows introduction last month in the U.S. House of Representatives by Congresswoman Madeleine Bordallo of companion legislation to the International Fisheries Stewardship and Enforcement Act; that bill has eight cosponsors representing the East Coast, Caribbean and Pacific States and Territories. Illegal, unreported and unregulated fishing spans the globe, threatening legitimate fishing operations, undermining sustainable fisheries management, and stealing a vital resource from needy communities and the world economy. Criminal fishing worldwide is estimated to take $10 billion to $23.5 billion worth of seafood annually, or 11 million to 26 million tonnes of fish—three to six times more fish than the entire U.S. commercial fishing industry catches legally every year. By passing these two bills, Congress would send a strong message that the United States will not tolerate crime on the high seas and that it is committed to protecting U.S. fishermen who play by the rules. Expand the authority of the National Oceanic and Atmospheric Administration and the U.S. Coast Guard to investigate, apprehend, and sanction violators for fisheries crimes committed outside U.S. Waters. Establish consistent protocols amongst all international fisheries statutes to simplify enforcement and regulations. This will streamline enforcement and level the playing field for U.S. fishermen that abide by the rules. Authorize a centralized list of illegal vessels—and their owners—to help track criminal fishing activity. This would allow the United States to deny port access and otherwise penalize vessels engaged in illegal fishing. Promote interagency cooperation among U.S. agencies engaged in fisheries enforcement, improving overall efficiency and effectiveness. Protect U.S. fishermen and seafood purveyors by closing U.S. ports to vessels engaged in illegal fishing and encouraging other nations to hold illegal fishing vessels accountable. Enhance national security by requiring all foreign fishing vessels to submit advance-notice-of-arrival information before entering U.S. ports. This would close a loophole that could be exploited by drug traffickers, human smugglers, and terrorists. Set minimum standards for dockside inspections and facilitate information sharing with other countries when there is evidence of illegal fishing. The two bills are widely supported by U.S. commercial fishers and conservation organizations, and both have strong bipartisan support. We urge Congress to pass these bills to allow the United States to crack down on illegal fishing on the high seas and ensure the future sustainability of our oceans. On Friday, 8 February 2013, the Royal Bahamas Defense Force hosted a Town Hall Meeting for the Fishing Community at HMBS Coral Harbor. Attending the meeting were the Minister of National Security, Hon. Dr. Bernard Nottage, Minister of State for National Security, Hon. Keith Bell, Picewell Forbes, MP, His Excellency, High Commissioner to CARICOM, along with other government agencies and fishing community representatives. The Town Hall Meeting was a dual-purpose event. Firstly, it was to communicate vital information to the Fishing Community about the multi-agency strategy approach that the government has initiated to address the concerns confronting the Bahamian fishing industry. To this end, presentations were offered by the Royal Bahamas Defense Force, Department of Marine Resources, Bahamas Immigration Department, Ministry of Foreign Affairs, Bahamas Marine Exporters Association and the Bahamas Commercial Fishers Alliance. These agencies highlighted the strategies implemented to mitigate the problems of illegal, unregulated and unreported (IUU) fishing and some of the future plans under serious consideration to strengthen the fishing laws, border surveillance and enforcement of The Bahamas’ fishing laws. The strategies, plans and considerations are in an effort to enhance the sustainability of The Bahamas’ fishing grounds both as a food source and a significant economic component of The Bahamas gross domestic product. Additionally, it was emphasized that within months, The Bahamas will be assessed to qualify for access to the international markets that its fishing grounds are regulated and provides for sustainment, and that fishery products utilized for local consumption and export are reported. The second purpose of the meeting was to create a forum to allow the fishing community to express their concerns and to get an immediate response from government officials and respective agencies. Some of the questions and concerns raised were the effectiveness of government agencies to enforce the fishing laws, fishing license recommendations, and the legality of non-Bahamians working on Bahamian fishing vessels and fishing in Bahamian waters. The Minister of National Security, Hon. Dr. Bernard Nottage summarized in closing to say that he has listened to the concerns and recommendations brought forward and will ensure that concerns and recommendations are communicated back to cabinet for further review and necessary actions. Additionally, Minister Nottage indicated that in the coming months, there will be other similar Town Hall Meetings for the fishing communities throughout The Bahamas to get the government’s message out on what is being done and what the future plans are, and also to hear from the various fishing community stakeholders.